This new featured content module is useful if you have non-technical staff who need to add blocks on the site that contain lists of node titles, node teasers, and/or full node content. This module can also be useful if you need to get up some related/featured content blocks quickly and are not familiar enough yet with views to do it. 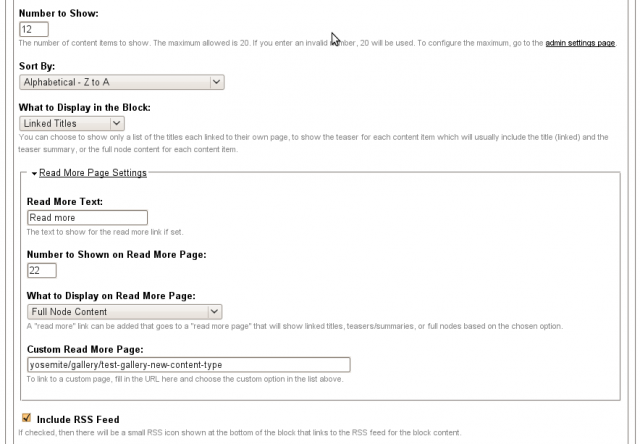 The content that shows up in the block depends on how the user configured the block. The content can be sorted alphabetically, by date, or by popularity, or can presented randomly. There are additional visibility rules available so you can choose to show the block based on the content type, user/author, or taxonomy terms available for the node page being viewed. 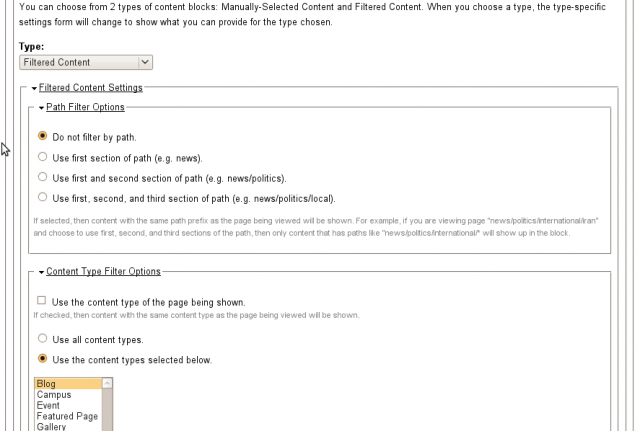 One option is to specify a manual list of paths to show. 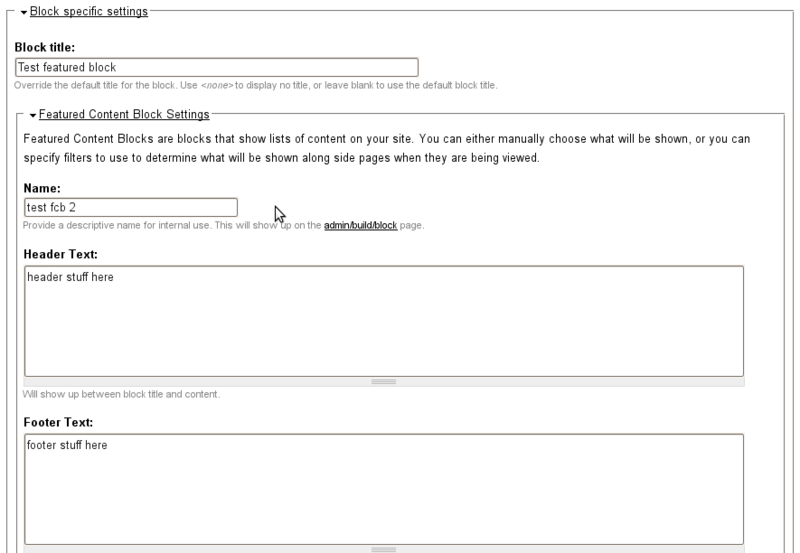 The advantage of this is if you know the pages you are interested in, but want them sorted in a particular way or you want to apply some additional rules for when the block should show up. The other option is to specify a number of filters to determine what content will be displayed. 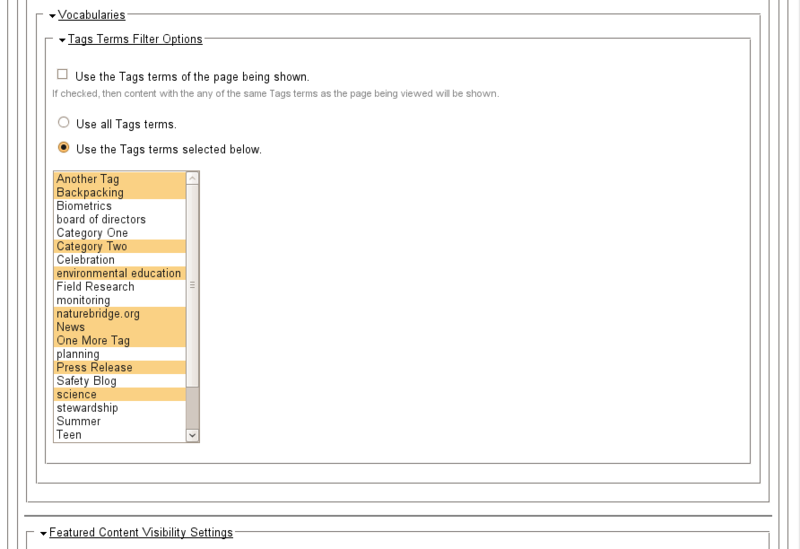 You can filter by content types(s), user(s)/author(s), taxonomy term(s), and by path. You can match the content type, author, or terms of the current node being shown, or can configure it independent of the page being shown. These can be combined as well. For example, you could chose to show a list of nodes that have the same author *and* content type as the node being shown. I know the Views module is supposed to be king of all Drupal modules. However, I am a blind web developer, and for some reason my screen reader does not work well with the displays when I go to build a Block or Page. So, when I came across this module to help me display related posts in my blog, I was unashamedly ecstatic. Thank you for making it so ridiculously easy to display and sort featured content without the need to use Views or manually code PHP. 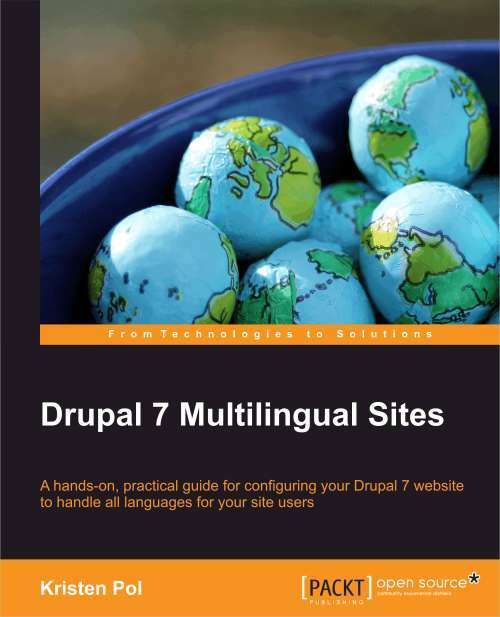 You have no idea how simple this task has become for someone still getting familiar with Drupal in general. Not sure how I missed this comment before but this is great :) Thanks for sharing! How can I make page that will act as a first page which means that I can add desired content on the way that I do it with "promoted to front page" in publishing options. Is there any options where I can make other option "promoted to second page" or something similar with same results? Please help and sorry if I post it in a wrong section! This is exactly what I am looking for, however I need the facility to select/choose related content/nodes when creating content. is this available? or is there any other way to accomplish this? Do you want to select related content per node? I don't currently have this functionality though would be willing to add it in. I would just need to figure out the best way to add it. Very well done indeed. everyone has said how great it is but I wanted to add that it is one of the cleanest codes I've ever seen. Sort nodes by number of common terms! I can't understand, why there are still new related/recommended/similar modules and almost none of them has option to sort by number of common terms, which is the most needed here. This is in the latest release. I would like to suggest, that programmers and non-programmers give this module a spin. Can you select the vocabulary? I have my site built with two taxonomy vocabularies. One is a category (news, interviews, reviews, etc...) and another that is a tagging system where you write in the artist name that the post is about. My question is that I'm trying to display links that relate to the Artists vocabulary and not the Category. Is this possible with your module? Sorry for the delay... just seeing this. 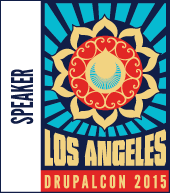 In the future, you may want to post questions at: https://www.drupal.org/project/featured_content. If you are using a free tagging vocabulary, it would work like any other vocabulary. If you are using a custom field that is not associated with a vocabulary, then it wouldn't work. This looks like a really nice module and a great addition. Looking forward to trying it out! warning: array_intersect() [function.array-intersect]: Argument #1 is not an array in /var/www/html/amanda/sites/all/modules/featured_content/featured_content.module on line 167. 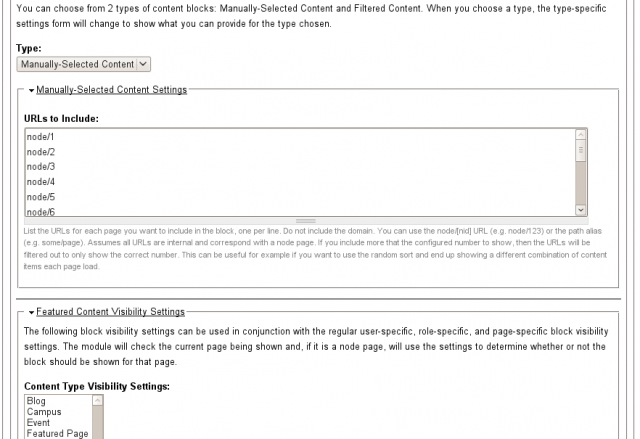 I have tried a number of 'Related Content' modules and disabled them because they did not offer the featrues I needed. This 'Featured Content Module', however, is unique. It solved my issues immediately, and I must say that the documentation is first-rate (not always the case with Drupal modules). Highly recommended. Thanks for sharing... I couldn't see a 'Donate' link on this site so I have visited a few of your Google Ads sponsors! 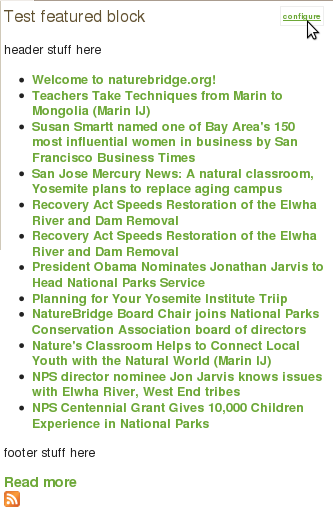 Feel free to donate to the non-profit sponsor: NatureBridge. They are doing great things. Glad you are trying it out! 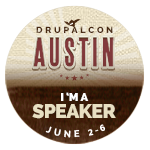 You can post questions here, or at drupal.org, or email me directly... whichever you prefer. 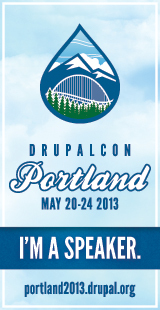 I have a few questions - would you perfer them here or at Drupal?